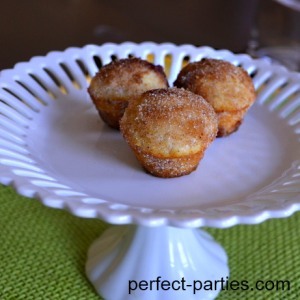 These easy to make Cinnamon Donut Muffins coated with cinnamon sugar taste like donut holes! You might want to double the recipe they are so good! Make these little treats for parties! Each is a perfect size for small children. Roll the entire muffin or just the tops with cinnamon sugar and serve in a dish. We liked them slightly cooled and still warm from the oven. 2 small dishes for melted butter and cinnamon sugar. Preheat oven to 375 degrees F (190 degrees C). Grease or spray with baking spray your mini muffin pan. We like Nordic Ware Bakers Joy Non-Stick Spray from any grocery store like WalMart. In large bowl mix 1/2 cup sugar, 1/4 cup melted margarine or butter and nutmeg. Add baking powder and flour. Stir until just mixed. Do not over mix. Fill the muffin cups about half full which was about a slightly heaping tablespoon. Bake in preheated oven until the tops are lightly golden about 15-20 minutes depending on your over. Ours took about 17 minutes. While it is baking in one bowl, melt 1/2 cup margarine or butter. In the second mix 1/4 sugar with 1 teaspoon ground cinnamon. When the muffins are done, lift gently out of muffin tin, dip in melted margarine, and roll in the cinnamon sugar mixtures. Serve the Cinnamon Donut Muffins in a pretty dish! If you are dipping only the top of the muffin in the butter and cinnamon sugar, cut the amount in half when preparing. Original recipe had 3/4 ground nutmeg. We like it a little lighter flavor and added only 1/2 but you can add a 1/4 teaspoon more if desired. With four of us (two adults, two children)as the main breakfast dish, we almost finished the entire pan! So double the recipe for larger groups.